It's the first day of chorus rehearsals and the Welsh National Opera singers are watching spellbound as Sweeney Todd director James Brining describes his vision for the work. A co-production with Wales Millennium Centre and West Yorkshire Playhouse, this is a revival of a production James has already directed twice before – but this time it's going to be bigger and bolder. James' enthusiasm is infectious. 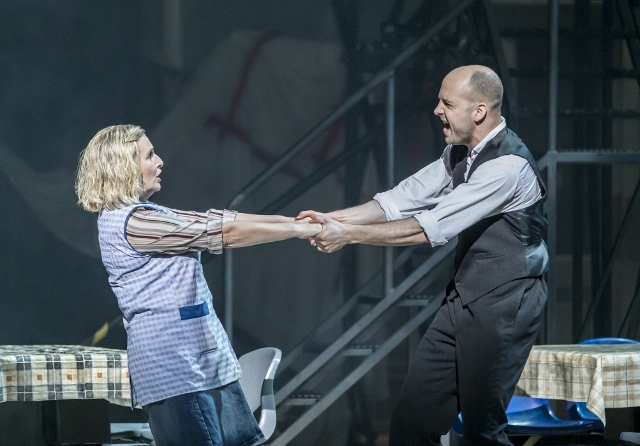 In his jeans and checked shirt, he paces up and down, waves his arms and laughs a lot – not something one would expect when discussing Stephen Sondheim's dark musical about the Demon Barber of Fleet Street. And James is in no doubts of just how dark that is. "The emotional stakes are so high, there's jeopardy, tragedy, politics," he says. "This piece is so powerful. It's the combination of the emotional personal journey and the political aspects and when you add in the music it's a truly shattering piece of work." 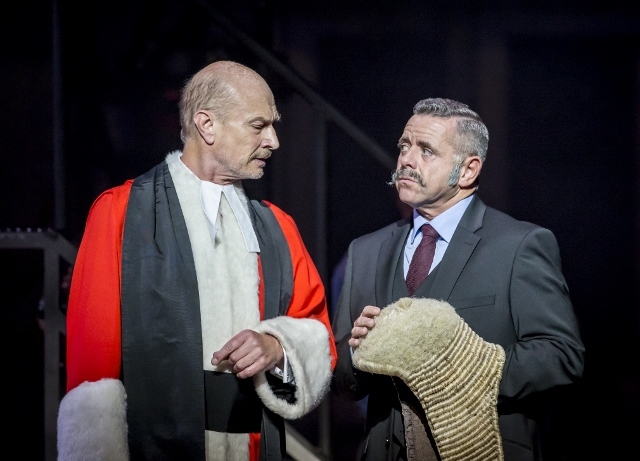 Sondheim's musical tells the tale of barber Sweeney who, after 15 years of wrongful imprisonment, returns to London in the hope of finding his wife and child. When told of their fate, Sweeney loses faith in humanity and joins with baker Mrs Lovett in a gruesome pact. Setting up a joint business, Sweeney's customers become victims, providing the ingredients for Mrs Lovett's famous meat pies. James is choosing to move this production away from the Victorian gothic in which it normally sits into a more contemporary setting. Now it's the 1970s and '80s, an era of Thatcherite individualism, a time when care in the community closed institutions and left people adrift and a time when greed was good. This modern setting aims to bring all the audience into the world of Sweeney Todd, blurring the bonds between fiction and fantasy, sanity and insanity, and hope with despair. All of these initial explanations from James are taking place in a giant rehearsal room at the WNO base at the Wales Millennium Centre in Cardiff. We are sitting within the set for the show so the chorus already have a clear idea of the visual side of the production. It's an austere set. The giant walls are industrially metallic, there is a grubby sink in the centre and on the rear wall are plastic curtains reminiscent of an abattoir. Huge shipping crates will move around the set – each a site for a different part of the story. Katie Heath-Jones, WNO Deputy Stage Manager for Sweeney, says the next few weeks will see the chorus not only learning their roles but also experimenting on how to use this space. "One of the challenges is that we are taking a production which has already been staged elsewhere but it is being extended. In the past there have been maybe just six people in the chorus but we have 29 in this production so it's about using the space to its best advantage. "James works in a very organic way so as we go forward and we see how the characters interact in this space he will be reacting to that." The huge set also needs to be ready to tour. "At Wales Millennium Centre we have a very large stage area but some of the venues we visit have much less room so we are rehearsing in the touring set," says Katie. "The cast find it easier to then suddenly have more space when they perform than the other way round." Alongside rehearsing for Sweeney, some of the chorus are also performing in the other autumn season productions Bellini's I Puritani and Handel's Orlando so it's been a busy few weeks. It's a tough season in other ways. At the end of November when Sweeney returns to Wales Millennium Centre the company will be performing it as a matinee and evening performance with a tight turnaround time. And with Sweeney Todd being renowned for its visceral staging, this is asking a lot of the team. "We'll finish the matinee at about 5pm and we then need to clean all of the stage and the costumes to be back on stage again at 7.30pm," says Katie. "When you think about how much blood there will be to mop up and clean from the clothes it's not going to be easy!" The production also poses some challenges for WNO's props department. "Most of the props have come from West Yorkshire Playhouse so we do not have to make them from scratch," says Sava Bell, Assistant Stage Manager. "But we do need to do some planning for the pies. "We have some prop pies which have been created by West Yorkshire Playhouse but the production also includes some of the pies being eaten so we will need some fresh ones. We've not looked into it in detail yet but because this is a touring production it might mean that we have to find different places to source the pies for each venue on the tour. "We have done this kind of thing before. Last season we had Hansel & Gretel and there is a huge amount of fresh food needed for that show. So in each venue I was sourcing frozen cakes from local shops. We would pick them up in the morning and allow them enough time to defrost so we could use them for the performance in the evening. You also have to make sure you clean it up properly so it doesn't get smelly!" And there's one other problem with the meat pies in Sweeney Todd – Janis Kelly who plays Mrs Lovett is vegetarian. "At the moment there is a scene in which she takes a bite from one of the pies – we'll have to decide what to do about that!" says Sava. Being the Demon Barber of Fleet Street who dispatches his customers with a razor blade, Sweeney Todd does also need quite a bit of blood. "Our props department is always ready for that," says Sava. "We have it in lots of different size 'pockets' and the cast have to carry them with them on stage. They then burst them open at the right moment. It does depend a bit though on whether we need squirting blood but the props department can cope with any kind of blood requirement! Back in the rehearsal room the chorus are being given the details of their individual profiles. Over the next few weeks they will develop these characters until they become second nature. They will learn the dimensions of the stage space, they will use the various props and they will enter the world of Sweeney Todd. It's a world that James is determined will catch the imaginations of the audiences who watch the performance. "I first saw Sweeney Todd at the National Theatre in the 1990s and it was extraordinary," he says. "Emotionally and theatrically it just gripped me. It couldn't have higher emotional stakes and everyone can relate to it. "By bringing it into contemporary times and by making all the cast a part of the story-telling, everyone watching also becomes a part of the story. It's compelling."